December is for clementines: it’s when they are in season and at their best, making the most welcome appearance on Christmas tables, or as a gift inside hampers and stockings. Once considered a special and exotic Christmas treat, they are now easily available… but not all clementines are created equal! Their quality depends hugely on where and how they are grown. 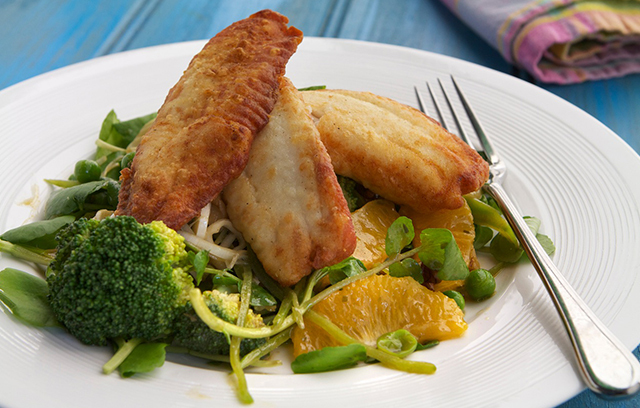 Simon’s Crispy Tilapia Salad is a nutritious but hearty dish that’s perfect for winter. He combines fresh vegetables with healthy fish and a zingy dressing for a deliciously flavoursome salad. Simon uses tilapia but you could use another white fish like pollack or dab.